What does your dream creative career look like? Now, how many steps are there between where you currently are and where you want to be? A few? Too many to count? Regardless of the answer to that question, you have the power each day to control how creative your life is, as you work your way toward your professional goals. Let’s look at seven routines that immediately add more creativity to your day. “Sitting down to think” often blocks your creative energy. There’s certainly a time for seriously concentrating on your work at a desk, in front of a computer or notebook, but taking time each day for physical movement is an essential part of a creative life. Being present in your body can help settle a noisy mind and give you momentum to innovate. Since I’m not a “morning person,” it’s important for me to move around as soon as possible after I wake up. Whether you’re a walker, a yogi, or weight lifter, take advantage of any types of physical activities during your day to create space for mental clarity. 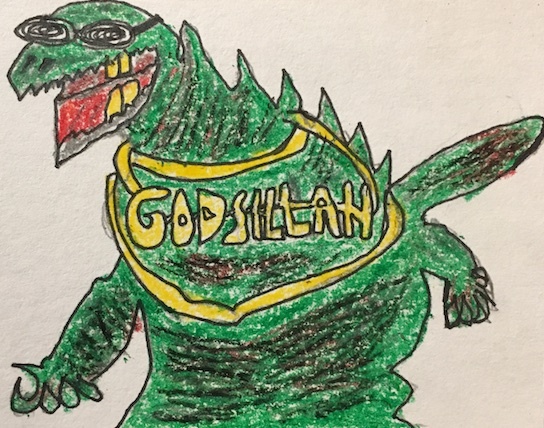 Last year, a friend asked if I could draw a picture of Godzilla for a project he was working on. The request immediately activated my perfectionist tendencies. It was a Wednesday night, and I began to clear some time over the upcoming weekend for the task. I needed to sketch out possibilities, refine my ideas, and precisely execute my vision. Then he said he’d like the drawing within the next couple of hours. It was like he kindly handed My Perfectionism her coat and was escorting her out of the building. So … I had a choice to make. Instead of insisting that I needed more time, I decided to take 20 minutes that night to complete the drawing. The exercise boosted my confidence and made me feel capable of tackling other art projects with more ease. Do you have 20 minutes to complete a creative activity each day or week? You’ll strengthen your skills when you consistently add mini projects to your daily or weekly routines. While starting and finishing a mini project in a short period of time is a great form of practice, sometimes your goal requires a long-term commitment. This routine is about discipline and sticking with a hefty project, rather than doing a bunch of tasks quickly and then getting burned out or losing interest. Once you break down your big idea into manageable tasks, just check off one item from your list each day — even if it’s something you can do quickly, like registering a domain name. You don’t necessarily want to do more, even if you have time. Simply get in the habit of taking steps that help you achieve your creative goal. Listening to music is a passive way to experience creativity. In contrast to making progress on your big project, this activity is about letting go. You don’t have to do anything to get inspired, but the sounds and lyrics you hear may indirectly (or sometimes even directly) influence your work. We have access to all different types of music online, so put on your favorites or discover a new genre. Observe how the experience transforms your mood or makes you feel more connected to other people. If you’d like to make this routine more active, analyze how the music draws in an audience. Select something you do every day that you love. It could be drinking your morning coffee or walking your dog. When you do that activity, take 10 minutes to focus on how good it makes you feel. Even if there are other parts of your day that are less enjoyable, making time to be present during a part of your day that you love helps you relax. And when you feel relaxed, you’re more likely to get new ideas or discover the next steps of a creative project. This routine is similar to “Amplify the love,” and it’s easy to incorporate because food is already a part of your day. Do you make the food you eat? Does someone else? Rather than take your food for granted and quickly gobble it up to satisfy your hunger, respect where it came from, how it was prepared, and the ways it will nourish you. Honoring the food that fuels you ignites your creative drive. You also talk every day, so choose your words carefully. Could you skip gossip and opt for phrases that make yourself and others happier? Eloquent, intentional speech will help you become a more eloquent, intentional writer. Use your conversations as opportunities to exercise your creativity and have more fun during your day. Have you ever brushed off guidance that sounded too simple to try? 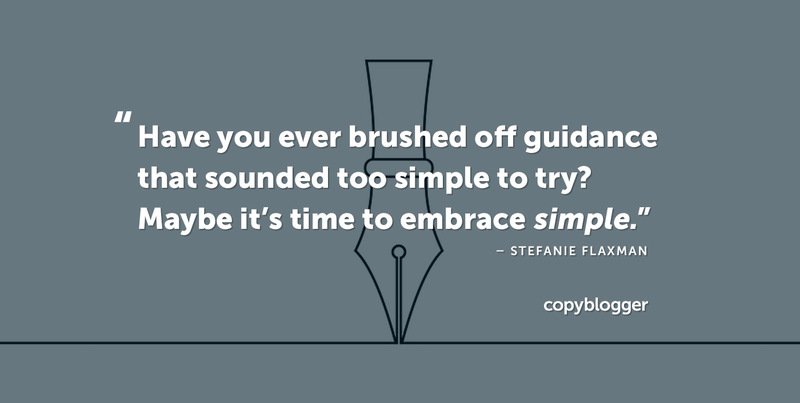 Maybe it’s time to embrace simple and seize creative opportunities already available to you. Rather than wait for someone to give you your dream creative job, you can birth your creative life through the actions you take each day. Sometimes one needs to avoid thinking about the size of the project and break it down into tasks (#3) or mini-projects (#2). Makes it so much easier to manage and unlocks the creativity. Something I try to practice almost everyday. Excellent advice. I have put off registering a domain name for weeks. Even though this is, as you point out, something I can do quickly, I keep getting hung up on all the steps that come after. But this was a great reminder that I should put aside the worry, and just get it started. Thanks! Here’s to an inspired and productive new year! Thanks for sharing. Like your post shares, do something you love. Mine is drinking a couple cups of hot bold coffee (black). Just enjoying this simple and refereshing treat every morning helps me to get in a good mood and to think creatively. I also journal and read my Bible first thing in the morning. So I guess it is a combination of several items. Thanks again for this post. Daily routines you love are quite powerful! I always thought “move more” was horrendous advice until I joined a gym, and I realised how many more ideas I was having while working out. And because of all the endorphins, I was also feeling more positive about those ideas, which made me more likely to put them into practice. Win! But you can’t argue with good results and there are lots of wins, if you’re open-minded enough to try! Glad you’re seeing those benefits, Icy! I feel a lot of pressure when I’m forcing myself to have a good idea or figure something out. Love your Godzilla. When I was an art student, we often had to draw something in a set block of time, usually 5-20 minutes max. Ironically, those drawings usually had such a relaxed, beautiful quality to them, much more than the more intense studies. Good advice!